Georges Bou-Saab, left, pictured with Jason Haynes, past president of MOVITE. 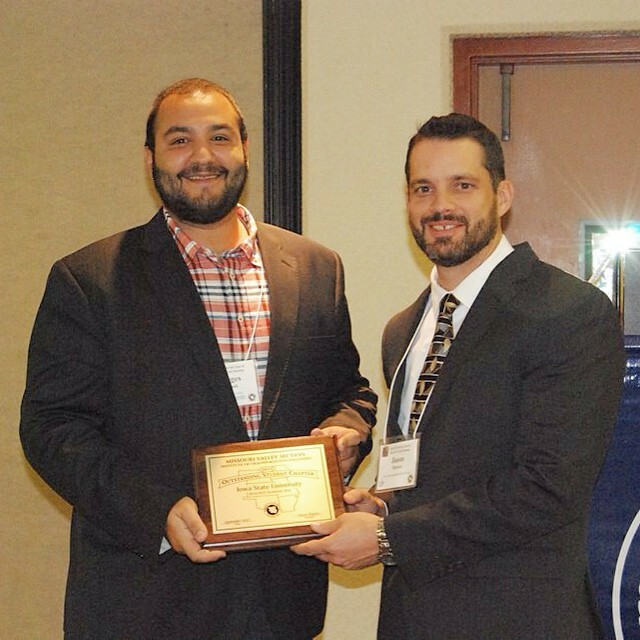 Bou-Saab was accepting the award for outstanding Transportation Student Association chapter. Iowa State University’s Institute for Transportation (InTrans) graduate student Georges Bou-Saab knows first-hand how improvements in transportation can make the world a safer and healthier place. It is the subject of his dissertation. It’s also the subject of an essay he wrote that led him to become a 2018 Lifesavers Traffic Safety Scholar. The scholarship grants $1,000 toward a trip to the largest traffic safety conference in the US. Bou-Saab will be returning to the Lifesavers Conference for the second year under the scholarship. This year’s 36th annual conference will be held April 22 to 24 in San Antonio, TX. Bou-Saab grew up in Dubai, where he regularly saw “atrocious crash incidents” and congestion that meant driving 25 miles could take two hours. One crash incident involving a drunk driver took the life of his best friend in 2010. “Ever since that unfortunate day, I decided to become an advocate for traffic safety and started raising awareness on our campus,” Bou-Saab said. His essay stressed how he worked with Dubai’s Roads and Transport Authority after that incident to raise awareness on the importance of using seat belts and the consequences of drinking and driving. Bou-Saab also expressed how autonomous driving is the future for a safer world and more efficient driving. Bou-Saab’s work on improving safety in the transportation field also earned him recognition from the Strategic Highway Research Program (SHRP2) safety data program and the Transportation Research Board (TRB) oversight committee that sponsored a student paper competition. His proposal “Beyond Safety: Utilizing SHRP2 Naturalistic Driving Study Data to Model Vehicular Emissions at Project-level for Different Work Zone Configurations” was among the papers selected. His paper focused on his dissertation work to use data to estimate vehicular emissions of harmful pollutants for various work zone configurations. Findings from the study have the potential to give transportation officials and engineers the ability to decide on appropriate work zone configurations for better health and offer health risk evaluations in transportation planning. He will present his findings at a special poster session at TRB in January 2019. Bou-Saab was also selected in March 2017 by the Center for Strategic and International Studies (CSIS) and the International Road Federation (IRF) to lead a research team assessing safety on the new silk road; he was also an IRF executive leadership program fellow in 2017 representing Iowa State and Lebanon, and a panelist at a CSIS event discussing the research they did into reducing the cost of roadway accidents in Kazakhstan. He is also the lone student in the Institute of Transportation Engineers Leadership program in 2018. He credits staff at InTrans for his opportunities. “I am grateful for the support from both my major professors, Dr. Omar Smadi and Shauna Hallmark, as they encourage me to pursue opportunities that will have a positive impact in my educational journey and career,” Bou-Saab said.